At Quorum, we make it easy to transfer funds between your own accounts, other Quorum members’ accounts, and accounts held at other financial institutions. 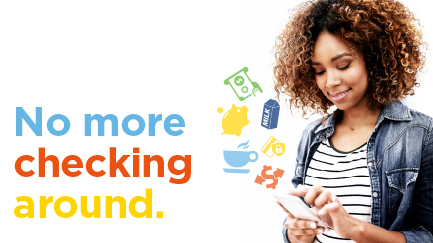 Online/Mobile: Log in to online banking or our mobile banking app and click on “Transfers” to set up one-time or recurring transfers. By Phone: Call (800) 874-5544 for our automated telephone service or to speak to Member Services. Representatives are available Monday through Friday from 8:30 a.m. – 7:00 p.m. EST. Your request will be processed within two business days. Once this has been set up, you will see the other member’s account(s) listed in the “To” dropdown in the Transfers service. This option allows you to transfer funds to and from your accounts at other financial institutions. Click on “Add/verify external account(s)” from the Quick Links menu on the right, then the “Link External Account” button. Enter the requested information and click on “Save” to submit. Once your external account has been verified, you will see the account listed in the “To Account” and “From Account” drop-downs in the Transfers feature in online/mobile banking. You can also securely transfer funds from almost anywhere in the world to your Quorum account via wire transfers. Simply provide your other financial institution with Quorum’s ABA Routing/Transit number (221981335) and your Quorum account information. If you have questions or need additional help transferring your funds, please call our Member Service Team at (800) 874-5544. Representatives are available Monday through Friday from 8:30 a.m. – 7:00 p.m. ET. This option allows you to quickly send and receive cleared funds electronically. From the Dashboard, click More, then Wire Transfers. Click Wire Transfers again, then select the type of transfer (domestic/foreign) you’d like to make. A receipt of your transaction will appear on the screen, and a confirmation letter will also be mailed the next day to your address on file. Call us at (800) 874-5544, Monday through Friday, 8:30 a.m. – 7:00 p.m. ET. To make a wire transfer, be sure you have the wire recipient’s: name and address, account number, financial institution name and routing number; for foreign wires, you will also need the SWIFT code (or international bank code). Did you know: You can also receive a wire transfer into your Quorum account, free of charge! To receive a wire transfer into your Quorum account (free of charge), simply provide your other financial institution with our ABA Routing/Transit Number (221981335) and your account number. You may also need to provide the mailing address for Quorum (2500 Westchester Avenue, Suite 411, Purchase, NY 10577). Checking accounts: Provide your 14-digit checking account number, also known as your MICR number. You can find this in online banking by clicking on your checking account, then the “Account Details” tab above your transaction history. *Fees apply: Domestic Wires: $20; Foreign Wires: $45. Fees will be debited from the member’s account once the wire is processed.